Thank you for that very important update! 5300 RAM upgrade is working stable. Samsung R60 plus laptop seems to only support up to this speed. 6400 was unusable with 4Gb (2x 2Gb), unstable with 2Gb (1x2Gb). 5300 no issues. Only 2.5Gb left after using Windows x64 which suprised me as so low, but it still leads to a much improved multitasking experience. What do you mean only 2.5GB left with x64? Do you mean in task manager you only have 2.5GB left free, or are you seeing that you only have 2.5-3.xGB somewhere else listed as useable? Installed memory "4.00 Gb (2.75 usable)" is the exact quote it says there. 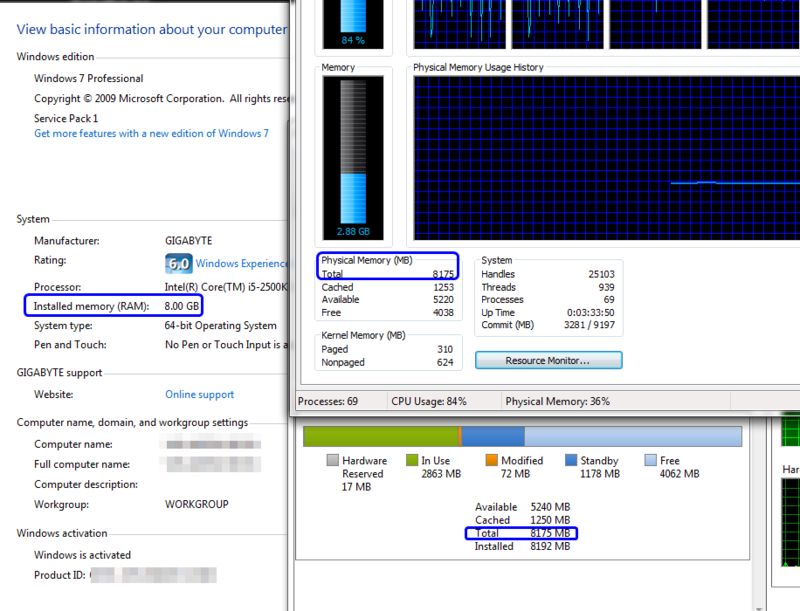 This is print screen of resource monitor. Why, does this look too low to you? Although that image is too small to see fully, yes, that doesn't look correct for a x64bit system! That is how it looks for 32 bit systems with 4GB. Can you show us a pic of your system properties (Right click My Computer, properties), thanks! I believe you, I just want to see it all in one place, system type and memory info. Did you or someone else set anything in MSConfig / Boot / Advanced Tab? (Windows Key + R, MSConfig) Maximum Memory should not be set or checked, and normal should be selected in the General tab. I think this is the tab you say...? And I'm about to get offline, so I wont be able to answer back until later or tonight. Hi, did you get the mod stuff you needed? Sorry, looks like I missed this post the last few days, probably because I replied last so I didn't check to see if anything new had been posted. Sorry about that!! You may want to try a clean install, or updating your BIOS first to see if that helps. You might also want to remove all of the memory, and clean the gold contacts on the memory with some rubbing alcohol and a q-tip or paper towel, let it dry out for a minute, then put it back in and be sure it's all fitted into the laptop properly. Latest BIOS is here (Version 09YI08YJ) if you want to try that before opening up the laptop again to clean the memory. And if you do open it up again, test with just a single module one at a time and see if they both show up properly or not. Im having a similar issue to the one above, ive got 2x2gb 6400 installed and running with no issues on the machine but as has now come up i only have 2.75gb useable in my properties as above. Although i am using windows 7 64bit and as a result cant find a bios for it to flash to try that, any suggestions?.